The Caribbean company of Dominican origin specialized in Design, Construction and Supervision, will execute 55 Villas for a total of 129 rooms and a modern Central Building in the Club Med project. SANTO DOMINGO, Dominican Republic, Dec. 11, 2018 /PRNewswire-HISPANIC PR WIRE/ – Grupo Therrestra, led by Engineer Hugo Pérez Ovalles, has inserted its characteristic identity stamp, based on: talent, adaptation and trust in the service of the prestigious Club Med Hotel Chain, to develop its most luxurious and prestigious project in the Americas, located in Miches, province of El Seibo. In the complex, located in Punta Hicaco, approximately 6 km from Miches, Grupo Therrestra will develop a total of 129 rooms and a modern Central Building. 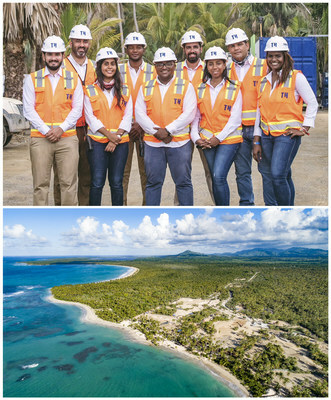 Miches being a new area to explore, where the French company specializing in premium All-Inclusive vacations has set its sights and placed its trust in Grupo Therrestra, one of the most requested Dominican construction companies in recent years by the main Hotel Chains of the world that operate in the Caribbean. In this sense, the CEO of Grupo Therrestra, being grateful for the trust awarded once again to develop this ambitious and strategic tourism project in the Caribbean, stated “With the construction of Club Med in Miches, we wrote a new chapter in the promising future that the Dominican Republic is building, betting on attractive and interesting Tourist Poles such as Miches, especially in high end tourism. A showcase appealing to millions of people around the world”. The project, whose first groundbreaking was led by President Danilo Medina, on May 3, 2018, it’s scheduled to open its doors by the end of 2019. The new development of Club Med in the area, with the impetus of Grupo Therrestra, represents a powerful alliance that will help to structure one of the most promising coastal areas for tourism in the coming years, such as Playa Esmeralda. Construction Company founded in 2004 with the fundamental objective of providing construction services for civil works. It is dedicated to the Design, Construction and Supervision of tourist, residential and commercial projects, both in the Dominican Republic and in the Caribbean, generating 4,000 jobs in the region.